When expat workers in the UAE are mentioned thoughts instantly turn to Dubai, with its increasingly blurred social infrastructure more and more skilled expat workers are opting for rewarding lives in the bustling and decadent city. However, recent developments have led to many people thinking that one of Dubai's UAE neighbours is set to steal its thunder and become the go to choice for western expats- Qatar. Much of this has come from the shock announcement that FIFA will stage the 2022 Football World Cup in Qatar. An event of such magnitude will only serve to increase demand for expat workers in the country, but this alone is not the only reason for expats to cast an eye towards Qatar. Whereas Dubai has reached a bit of a halt following years of strong growth, Qatar is currently in an economic boom. 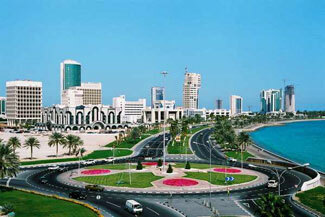 The capital city, Doha, is a bustling, modern city that is fast eclipsing the bright lights of Dubai. Unlike its neighbour construction projects are currently at a height and infrastructure projects are planned. Reports show that the country has an initial $80 billion set aside for development projects, and an extra $57 billion earmarked for World Cup-centric projects. Amongst the employment prospects Qatar has other benefits for the expat worker. Of course the weather is superior than the UK's, however there are also significant financial benefits. Working away from Britainn enables you to detach yourself from UK taxes, and also take advantage of offshore pension plans. Recently the United Kingdom signed a double taxation agreement with Qatar meaning that Brit expats who become permanent residents in Qatar can reap the full reward of the Emirate's tax-free salaries, without worry of taxation back home. If you are interested in learning more about the expat opportunities of Qatar visit our city guide section where you will find a detailed guide looking at employment, visas, healthcare and more.